This beautiful beaded bracelet was made with white marble glass beads, Czech glass spacers in in between sets of three beads and Moonstone beads. The combination is so pretty and these are the only beads of this kind, (the white glass marble) I have left. This is a stretch bracelet, so it's easy to put on/take off and is light weight. There is a Sacred Heart of Jesus charm with a cross of the reverse side, a small Jesus name charm and an angel wing. This bracelet is very neutral so it will match anything. This bracelet is a beautiful way to remind whoever is wearing it that Jesus is with them always, died for their sins and lives on forever. The angel charm stands for how ready and able the angels are to help and guide you throughout your life...all you have to do is ask! A gorgeous bracelet to be worn all year, it also makes a perfect gift for Easter, Mother's Day, Birthdays and more. If you'd like a similar bracelet in a different size or colors, please let me know and I'll do my best for you! 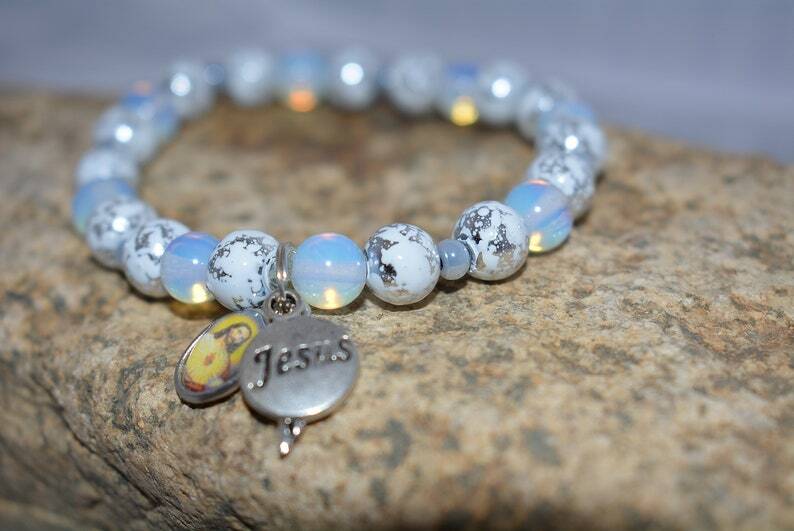 The only one I have that's exactly like this is this one and it's a size 7.5"
Jesus Bracelet, Sacred Heart of Jesus, Religious Bracelet, Religious Gift, Easter Gift, Beaded Jewelry, One of a Kind, Size 7.5"
Together We Can Make A Difference Beaded Bracelet, Inspirational Bracelet, Moonstone, Blue, gift for her, Inspirational Gift, Beaded, 7.5"
Virgin Mary Bracelet, Religious Bracelet, Blessed Mother Bracelet, Religious Gift, Blue, Easter Gift, Angels, Gift for Her, 7.5"
Miracles, Angel Wing, Watermelon Tourmaline Quartz, Beaded Bracelet, Heart Charm, Gift for Her, OOAK, 7.25", Colorful! Be Still, Inspirational Bracelet, Hand Stamped Jewelry, Angel Jewelry, Gift for Her, Boho Bracelet, Beaded Jewelry, Green, OOAK, 7.5"
In love with this bracelet. I'm so happy I purchased it. I lost my cat unexpectedly in October and had been searching for a bracelet that would be in memory of him, when I saw this one I knew it was the one. The colors are gorgeous and it makes me feel like he's with me. I've gotten many compliments on it as well. It's very well made and shipped extremely fast. Thank you for making such a lovely bracelet. I love love love these bracelets, I had given one to my mom as a gift, she loves it. Very comfortable fit. Reserved for Milanka: Matching set Amber Color Bracelets, Two Bracelets, Cross Bracelet, Tigers Eye, Custom Order, Matching Bracelets, 7"
Reserved for Milanka, Black, Silver Beaded Bracelet, Leaf Charm, Custom order, Dressy Bracelet, Angel Wing, Gift for Her, Made to Order, 7"
Miracles Bracelet, Beaded Bracelet, Gift for her, Inspirational Bracelet, Sandstone, Druzy, One of a Kind, Handmade Bracelet, Angels, 7.5"
I accept Paypal and Direct Credit Card payment available through Etsy. If you need to cancel an order please contact me and I will gladly accommodate your needs. I can put items on hold (usually for 24 hours), just contact me with a request and I'll be happy to do so. *All sales are final, however, if I made an error in the listing or in your bracelet order, (i.e. the wrong color, size, charm), please contact me. I want you to be happy with your Hope Angel Bracelet! I will accept a return, but please contact me within 3 days of receipt so I can make the necessary arrangements. *Exception: If your bracelet breaks under normal wear within 30 days of purchase, (hasn't happened yet! ), please contact me. I'll do my best to send you a new one or one close to it depending upon my supplies. Again, I want you happy with your order and with my customer service. When possible, send the beads to me and I'll use them to create a new bracelet for you. All refunds are issued less shipping costs. 1) The item must be mailed to me within 4 days of the agreement to issue a refund. 2) Please make sure you return the item packaged in the same way it was sent to you. 3) The item must be received in the same condition as when it was shipped to you. I will ship your bracelet(s) within 1-3 days of payment in the U.S.A. through the USPS. If it's a custom order, we will be in communication as sometimes they take a bit longer. I take the time to package all items well and securely. Please feel free to communicate with me throughout the process to ensure your order is just what you want. In case your item is lost in the mail or arrives damaged in transit, please let me know right away. If damaged, please photograph the damage and email the photos. USPS and third party insurance companies require proof of damage in order to begin a claim process. Make sure you keep the original packaging materials as well as the damaged piece(s) for further investigation in the claim process. Please do not return items damaged in shipping before contacting me, since this will void the shipping insurance. Beaded Bracelet, August Birthday Gift for Her, Boho, Stretch Bracelet, Peridot, Handmade, Angel Bracelet, Inspirational Gift, OOAK, 7.5"